Crystal's Feedback: "You're amazing! I love it!" Crystal is a returning customer. I previously did her business cards for her freelance makeup business. 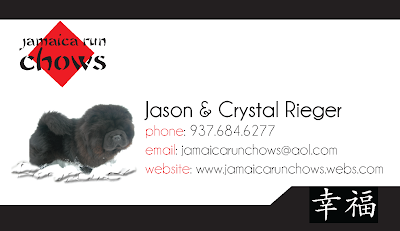 This time around I did her cards for her company, Jamaica Run Chows. You can purchase beautiful Chow pups from Crystal and her husband or just see how Peppy, their award winning Chow does in his competitions! Thanks Crystal!